Here is an opportunity to call into a radio show and ask some good questions about hemp. Corporate Strategies with host Tim Connolly and his guest Jerry Kroll CEO of Hemptown Clothing will air on this Sunday night August 1st from 9:00 to 10:00 PM EST. Listeners may call in questions live and toll free about the company to Jerry Kroll or Tim Connolly at 1-866-606-TALK (8255). To listen online go to: Business Talk Radio or Corporate Strategies and click on "Listen Live". You will need Windows Media Player. Please click here for the Corporate Strategies Radio Show Archives. The full Hemptown press release is on PR Web. Remember, good hemp questions displace the pot questions shows like this always seem to devolve into. Hide the kids, today we're discussing a something scarier than Michael Moore on The O'Reilly Factor - Wild Marijuana! It seems a little early to me, but annual hunt for feral hemp is on in the American midwest and stories are popping up in the local papers. In Iowa Scott County officials hunt for wild, illegal plants. "Every year, they cut down and burn between 15,000 and 20,000 wild marijuana plants ranging from 4 inches to 10 feet in height." Sheriff Dennis Conard said "That's a lot of wild marijuana," he added. "This is remnants of 50 years ago." The author of the story did note that "Growing cannabis plants, of either the hemp or marijuana varieties, is illegal in the United States." It's nice to see the distinction made between the different varieties. Industrial Hemp is a number of varieties of Cannabis sativa L. that are intended for agricultural and industrial purposes. They are grown for their seed and fiber content as well as the resulting byproducts such as oil, seed cake, hurds, etc. Industrial Hemp is characterized by being low in THC (delta-9 tetrahydrocannabinol) and high in CBD (cannabidiol). THC is less than 1% and in Canada and Europe the current legal level for cultivation is 0.3%. The ratio of CBD to THC is greater than one. Marijuana is a preparation made from varieties of Cannabis sativa L. that are intended for medical and recreational drug use. They are grown for their THC content, primarily in the flowering tops and to a lesser extent in the leaves. Cannabis sativa L. grown for marijuana is characterized by being high in THC (delta-9 tetrahydrocannabinol) and low in CBD (cannabidiol). The THC content is greater than 1%, usually 3% to 20%. The ratio of CBD to THC is less than one. The THC level in ditchweed it really low, too. I have a copy of a lab analysis of 50 ditchweed plants and the results show that the THC level is less than 0.1% and the CBD level is 2.6%. So, obviously ditchweed is feral (a. Existing in a wild or untamed state. b. Having returned to an untamed state from domestication). The USDA had an extensive hemp breeding program run by Lyster H. Dewey. Hemp varieties like Kymington, Chington, and Chinamington, which were bred in the USDA program, are now lost forever, as is noted in Chapter 10 of "Fiber Wars: The Extinction of Kentucky Hemp" by David P. West, Ph.D. The tragic element of this story is that as a result of the pariah status to which hemp was relegated in the US, Kentucky hemp is now extinct. The germplasm produced in Dewey's breeding program and all that collected by the USDA is lost. The National Seed Storage Laboratory, located in Fort Collins, Colorado, is charged with the preservation of germplasm as a safeguard against national disaster, such as nuclear war. In the early 1960s, ten bags of hemp seed, the only known remnant of the Kentucky hemp varieties, were transferred there from the USDA. A USDA Yearbook report noted that "Flax and hemp are no longer produced for fiber in this country, but seed stocks of the best varieties that have been developed by research agencies are maintained." Fortunately for flax, a responsible effort was made to preserve its germplasm. Sadly, the hemp remnant was neglected. At the request of the author, NSSL searched and found these bags of hempseed. Apparently, they were never logged in as accessions of the lab. Consequently, they were not properly preserved. The bags are only labeled with numbers whose import was not recorded, so we cannot know which varieties they might have been. The seed was last grown, as far as can be determined, in 1948. 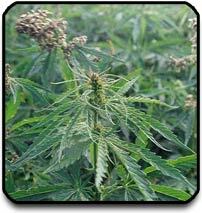 Feral hemp (ditchweed or wild Cannabis), which grows uncultivated across the Midwest, is the remnants of this lost germplasm. It is being eradicated under DEA's Domestic Cannabis Eradication/Suppression Program (DCE/SP). The DCE/SP's objective is to "conduct programs of eradication aimed at destroying wild or illicit growth of plants from which controlled substances may be extracted." This amazing resource should instead be collected, cataloged, and preserved! "Troopers also are responsible for removing wild hemp plants, which were grown under government sanction more than half a century ago to produce rope for World War II naval operations. 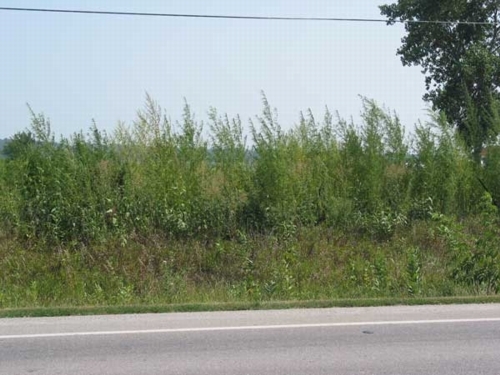 Last year they removed more than 200 million wild marijuana plants in Northern Indiana." Though the 200,000,000 plants number seems a little far-fetched to me. In the DEA Briefs & Background, Drugs and Drug Abuse, State Factsheets, Indiana they reported that "As a result of DEA's Domestic Cannabis Eradication/Suppression Program, the Indiana State Police eradicated 220,000,000 plants growing wild in northern Indiana." According to the official numbers (from a table adapted by SOURCEBOOK staff from table provided by the U.S. Department of Justice, Drug Enforcement Administration) from the Sourcebook of criminal justice statistics Online the number that Indiana reported to DEA was 219,124,925 ditchweed plants eradicated. The next highest number of plants eradicated was Oklahoma with 9,995,153 plants. In the Vermont State Auditor - Cannabis Eradication Report the State of Indiana reported 30,087,547 ditchweed plants eradicated in their 1996 Domestic Cannabis Eradication/Suppression Program (DCE/SP) Results. So, to go from 30,087,547 plants in 1996 to 219,124,925 in 2003 is quite a jump. What are they using to harvest this bumper crop with, combines? So, how do they fill out the form above and submit DCE/SP results if they can't tell the difference? 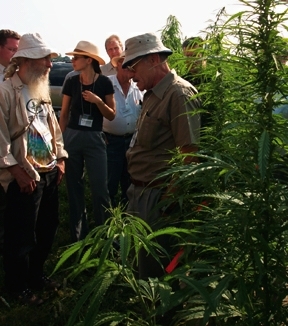 There was a nice story on the Ontario Hemp Alliance Hemp Field Day 2004 by Don Robinet in yesterday's Chatham This Week. From the report on the home page of the OHA web site it very successful event with good speakers, good crowd, and good weather. There is also a nice selection of pictures on the OHA web site as well. 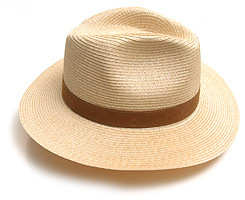 It looks like the Lightweight Hemp Hat from Lee Valley was the most popular headwear. We hope to have more to report on this great event soon. It is nice to see Hemp breeding coming of age. Weigh all ingredients in bread machine work bowl in order above. Start bread machine. Scrape down the work bowl a few times during the initial mixing to get the ingredients off the sides and incorporated in the dough ball. You may need to sprinkle in a little extra bread flour if the dough is too wet. This recipe consistently turns out great loaves in the Breadman Ultimate. I like to use bread flour and whole wheat flour from King Arthur Flour. I use the white, 2 pound, medium setting. I use Fleischmann's Instant Yeast (or Fleischmann's Bread Machine Yeast) because it can be mixed with dry ingredients. For consistent results I use a scale that I got from King Arthur Flour, which is why the ingredients list is only in weight. I see on the King Arthur Flour web site that they have the New Zojirushi Bread Machine. Sweet! 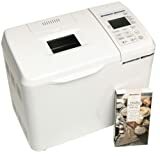 Note: If the link to the King Arthur Flour Zojirushi Bread Machine web page does not work properly and you get an error page please click on your Back button and click on the link above again. 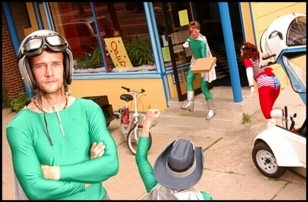 Galactic Pizza got a very nice write-up in the Minneapolis City Pages today. Their hemp pesto sounds wonderful. A pizza worth ordering just to see who would show up at your door. 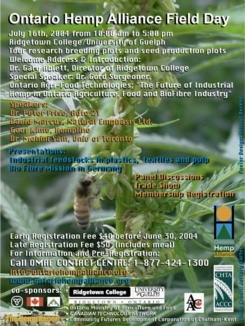 I've just been informed that CBC Radio One in Windsor will be playing the interviews they did at the OHA Ridgetown Hemp Field Day today at 5:40 PM (Ontario time) at 88.1 from Chatham and also available for listening in real time at http://www.windsor.cbc.ca, just click on the "CBC Windsor 1550 Live " link just above the windsor.cbc.ca logo. One of the people interviewed by Heather Cohen of CBC is Robbie Anderman of Cool Hemp. You will need RealPlayer. The Hemp Report welcomes a new sponsor. Linda and Chris Robinson are Hemp farmers and marketers, located in Carberry, Manitoba, which is between Winnipeg and Brandon on the TransCanada. As a pedigreed seed grower, Chris Robinson sells hempseed, wheat, and rye. Linda, "the Hemp Lady " attends trade shows across western Canada, bringing her brand of quality body care products direct to new customers in the hemp hinterland of western Canada. Following a unbroken family farming tradition of 125 years on the Carberry Plains, the Robinsons are bullish about the prospects of hemp for Prairie farmers. The Hemp Report appreciates their support. Please visit their web site at: www.hemplady.com and show your support. Hemptown put out another press release out on Canada NewsWire today. Things seem to be getting really interesting in their quest to make field to fabric a reality for hemp in Canada. Dr. Wing Sung, Lead Researcher, National Research Council of Canada, and Jason Finnis, President of Hemptown Clothing Inc. will be conducting a presentation on Monday July 19th at 1:45 pm at the Jesters Grill & Tap Room in Vancouver, BC. If you have not read the story Cover Me with Hemp at the NRC web site it is a good read and well worth your time. This is the Mann/Harrelson documentary that played last year at the Toronto Film Festival where we see Woody Harrelson take the road on a biodiesel bus and does pit stop lectures at various west coast colleges, speaking on the theme of personal choices and their effect on the planet's ecology. It's an amusing and endearing travelogue -- there's some nice music (Bob Weir at the bus stop playing That's it for the Other One on acoustic is nice and there are many other musician cameos) and some great scenery (Redwoods, Northern California coastline). But big problems: as presented, Harrelson and his gang of raw food yogists aren't that interesting as people. The Steve story line and Joe Hickey's bike crash help some, but the people element isn't really developed. So on it's on to the issues. Species are dying, plants are disappearing, we all got to do something, yada yada. Ok. So we see pictures of clear cuts, and then cut to Carolyn Moran of Living Tree who has two minutes to make the case for tree-free paper. BGH gets milked a lot - go dairy free- but the claims made aren't really analyzed, good thing being a vegan clears up skin blemishes though. Hemp's a solution but you never see a plant. How did they make the biofuel anyway? Cigarettes are always bad of course but pot is good. Raw food is a solution, but hey, you need a personal chef. You meet a worm farmer, an organic farmer, the Ruckus Society, Ken Kesey, a lady who agrees with the message and not the activist method. Basically it's a catalogue of cameos and a shopping list of causes and easy solutions and a little discussion (but not much). The scene with the crystal meth heads stands out. Three bug eyed kids in a logging town, up for 4 days and bug eyed wide, drinking coca cola and inhaling computer screen cleaner while they talk to the Bus-ers about stuff. There's a hint of Deliverance, sniffing at the edges, around it. I wonder what Harrelson's College talks were like. The filmmaker strangely doesn't want to spend a lot of time on them. He's happier to focus on the bike riding. This film lacks the impact of a Moore movie, a Supersize Me or the sleeper hit of The Corporation. When I saw The Corporation, the theatre was sold out. They added extra shows that day. When I saw Go Further on a Sunday night, there were a dozen people there. Can't say those dozen people will go home and tell other people to see this movie. Too bad: North American theatre goers are enjoying a renaissance in documentary filmmaking, probably the flip side of all those ubiquitous reality TV shows but anyway, clearly both the standard and audiences expectations has been raised. Overall, the fluffy and friendly Go Further is low calorie. If you're going to make a film about the very important issues of personal choices, food and sustainability, lets have some meat. on July 16th at Ridgetown College/University of Guelph, Guelph, Ontario, Canada.